When determining whether a vehicle can display emergency lights in the state of Illinois, the motor vehicle statutes have clear rules about which cars and trucks are allowed to do so. The role of the vehicle and the agency or professional to whom it belongs will determine what color lights can be displayed, and in which situations these lights can be turned on and used. The laws regarding emergency vehicle lighting in Illinois, detailed below, break down and specify the colors and types of lights and which vehicles can display them and when. According to Illinois state statute 625 ILCS 5/12-215, section A1, police vehicles are permitted to display red or white lights. Police lights can be oscillating, rotating, or flashing strobe lights. Section B9 of the same statute permits the use of amber lights in addition to red and white lights on law enforcement vehicles. Section E requires that lights on the police vehicles are visible from up to 500 feet. These regulations apply to local, state and federal law enforcement vehicles. Sections C2 and C3 allow the use of blue lights on state and local law enforcement vehicles in cities with a population exceeding 500,000 when red and white lights are also in use. Section A2 of the aforementioned statute allows personal vehicles used as law enforcement vehicles to display red and white emergency lights when several conditions are satisfied. The car or truck must be designated and authorized in writing by local authorities to serve as a law enforcement vehicle. This authorization must also be carried in the vehicle at all times to be presented upon request. Fire trucks are also permitted to display several colors in their emergency lights. 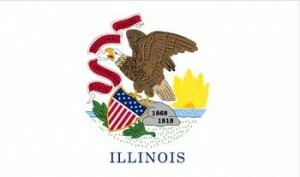 Illinois state statute 625 ILCS 5/12-215, section A3, (http://www.ilga.gov/legislation/publicacts/pubact92/acts/92-0782.html), permits that local, state and federal fire vehicles are permitted to display red or white oscillating, rotating, or flashing lights. Section E mandates that all lights mounted on fire vehicles are able to be seen up to 500 feet away. These regulations apply to local, state and federal law enforcement vehicles. Section C4 permits the use of blue lights on local, state and federal fire vehicles in cities when red and white lights are also in use. Section C1 of the same statute allows some personal vehicles belonging to firefighters to display red and white emergency lights. This applies to firefighters that are paid in full, partially, or who serve as call firefighters. A member of the board of trustees of a fire district is also permitted to display the lights on their personal vehicle. These vehicles are only allowed to activate their lights when responding to a truly emergent situation. The rules for volunteer fire fighters in the state of Illinois are slightly different than for government owned vehicles. State statute 625 ILCS 5/12-215, section C1, (http://www.ilga.gov/legislation/publicacts/pubact92/acts/92-0782.html), personal vehicles belonging to volunteer firefighters can display blue lights that oscillate, rotate or flash. Volunteer fire vehicles are only permitted to turn on their emergency lights when responding to a true emergency. Section E mandates that all lights displayed and activated on volunteer fire vehicles are required to be visible up to 500 feet away. Section C-1 of the same statute provides for further emergency lighting on volunteer fire vehicles. These vehicles can be outfitted with flashing blue grille strobe lights and flashing white headlights. These additional lights are also only permitted to be used when the vehicle is responding to an emergency. Per to Illinois state statute 625 ILCS 5/12-215, section A5, (http://www.ilga.gov/legislation/publicacts/pubact92/acts/92-0782.html), all vehicles designated as ambulances or rescue vehicles are permitted to display red or white lights. The oscillating, rotating, or flashing emergency lights are only allowed to be used when responding to an emergency and transporting the sick or injured. Section E states that lights on the ambulances or rescue vehicles need to be seen from up to 500 feet away. Section C5 permits the use of blue lights when red and white lights are also in use. These lights are also prohibited from use unless the vehicle is going to an emergency call. Section C-1 of this statute permits paid or unpaid ambulance and rescue squad drivers to add blue lights to their personal vehicles. These vehicles can be outfitted with flashing blue grille strobe lights and flashing white headlights. These rotating, flashing, and oscillating lights are also only permitted to be used when the vehicle is responding to an emergency. According to Illinois state statute 625 ILCS 5/12-215, section B1, (http://www.ilga.gov/legislation/publicacts/pubact92/acts/92-0782.html) tow trucks are permitted to display flashing amber lights with several stipulations. These oscillating, rotating and flashing lights must be used when actively responding to a disabled vehicle and loading it. If the bed of the truck is designed to hold all of the wheels of the disabled vehicle, that lights should not be activated while towing. If some of the wheels remain off of the bed of the tow truck, then the amber emergency light should be engaged to warm other drivers of the potential traffic hazard. 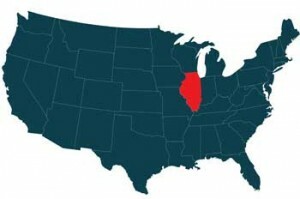 Tow trucks licensed in states other than Illinois are permitted to be outfitted with red and white emergency lights and will not be ticketed when passing through the state. However, the tow vehicles are not allowed to activate these colored lights when completing a tow in the state of Illinois. Tow trucks are not permitted to display blue lights. Vehicles belonging to state or local authorities for construction or contracting purposes can utilize amber lights per state statute 625 ILCS 5/12-215, section B2, (http://www.ilga.gov/legislation/publicacts/pubact92/acts/92-0782.html). The lights should be rotating, oscillating or flashing, and should only be activated when the vehicles are in use for maintenance or construction. Vehicles servicing public utilities, municipalities and other maintenance services are permitted to mount amber emergency lights per Illinois state statute 625 ILCS 5/12-215, section B4. The lights should only be activated when the utility vehicle is in service on a highway in order to indicate a potential traffic hazard and for cars to take care as they prepare to pass or overtake the utility truck. The lights should also be oscillating, flashing or rotating. According to state statute 625 ILCS 5/12-215, section B11, any vehicle displaying a slow-moving vehicle sign can be outfitted with amber emergency lights that flash, rotate or oscillate. As further outlined in statute 625 ILCS 5/15-301, section G amber lights can be on all pilot vehicles escorting loads over 12 feet wide. The driver of a pilot vehicle must also be at least 18 years old and licensed in the state of Illinois to operate the vehicle. Vehicles that are utilized by an alarm responder, security company, or control agency can display amber emergency lights per 625 ILCS 5/12-215, section B13. Only vehicles that are bound by a federal, state or local government contract are permitted to use the emergency lights. Section B14 allows for Department of Human Services security vehicles to display amber lights as well. These lights can only be activated when used for security-related purposes. The situations in which the lights can be used are at the discretion of the superintendent at the facility and site where the vehicle will be used. In both cases, the amber lights should be rotating, flashing or oscillating. The motor vehicle statutes for the state of Illinois clearly delineate the colors of and circumstances in which emergency warning lights can be displayed on different types of vehicles. The regulations vary depending on the role of the vehicle and whether it is owned privately or by the government. It is important to follow the laws set forth by the Department of Motor Vehicles in the state of Illinois for emergency vehicle lighting.